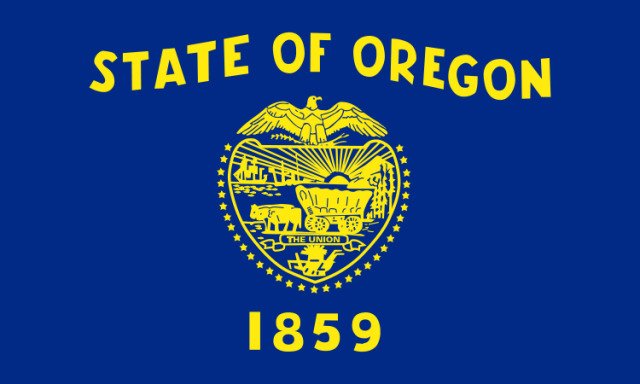 While one of the typically bland gold on blue flags common to many states of the Union, the Oregon flag has some unique characteristics. The covered wagon pulling oxen would seem obvious from the famous trail. And there is a hint of evergreens and agriculture along with the golden sunset into the Pacific with an old sailing ship and modern (for the day) steamship. But note the year prominently displayed. That gives a clue to the important slogan on the scroll "The Union." Yes, Oregon was established as a Free State for Free Men [and Women] in defiance of the interests who would spread slavery into Western Territories to become Slave States furthering the power of Southern Slave lords who practiced "the Divine Right of Kings." As Lincoln put it, "You work and I'll eat the bread." 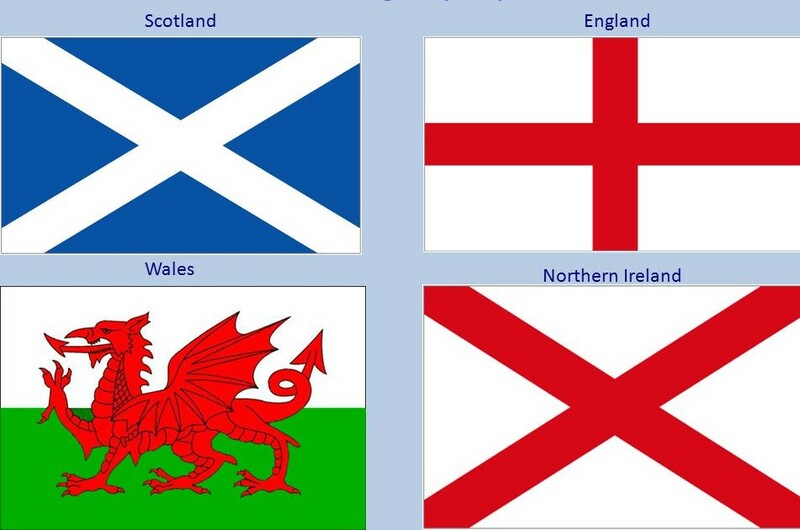 The flag is also unique for having a different backside. It's the Oregon Beaver with historical significance due to the fur trapping industry and the Astorians (with an Oregon city named for them). And the beaver is every bit a symbol of industry as the honeybee of Utah. So, how did this flag nearly get me into a duel? Well, it was in South Carolina. The Palmetto State is an interesting place. I've visited Columbia a few times because the Department of Justice has a national training center there. Sometimes they invite attorneys from other federal agencies. I've even been on a panel once about complex settlement negotiations (successful land exchanges among the Forest Service, BLM, the City of Los Alamos, DOE, and the Pueblo of San Ildefonso). The SC State House Building proudly preserves the marks of cannon balls fired by Sherman's troops. I enjoyed visiting and seeing some of the historical sites in my limited time (never had the chance to get to Charleston, though). Anyway, friends from my office - from our installations all around the country, and our local U.S. Attorney's Office would hang around together. Only one of us sort of a Southerner from Oklahoma, we were generally amazed at the Confederate Culture still prominent. 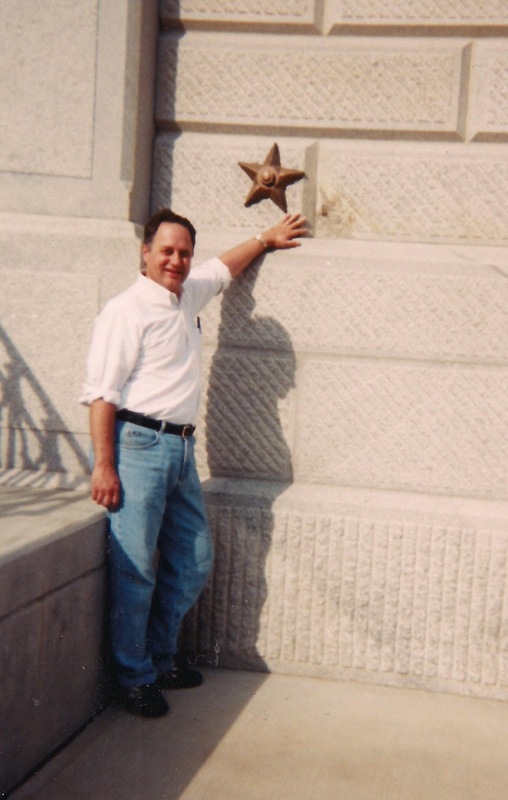 There is an old cemetery right downtown with gravestones of names like "States Rights Smith." They named their son, "States Rights?" (Was that "States" for short? or maybe just SR?) And there was the ongoing controversy about the Confederate battle flag and monuments to heroes, including one to Strom Thurmond put up by his children (except there was no mention of the illegitimate one he had by his former African-American nanny). And I wasn't the most belligerent anti-Southerner in our group. One of our Assistant U.S. Attorney friends from New Mexico (raised back East, apparently north of Mason-Dixon), stood on the veranda of the training center, genuinely furnished with rocking chairs, and stated, "If the South had won the Civil War, South Carolina would be just another banana republic." Probably true, but "yikes!" When I got to the part about "The Union" banner, a well-dressed, aristocratic gentleman from the next table stood up and said, "Sir, I'll have you know that I am a son of the Great Commonwealth of Virginian and on our flag it says, 'Sic Semper Tyrannis!'" Stunned, but not too intimidated as the dapper little man was not that large, I blurted out, "Isn't that what Booth said when he shot Lincoln?" I suppose the proud son of Virginia must have been some kind of federal official or he wouldn't be there, so perhaps coming to himself and his allegiance to the Constitution of the more perfect Union, he sat down. We northern sympathizers just looked at each other in stunned silence. Good thing dueling has long been prohibited under federal and I assume most state law. My great-grandfather and two of my great-great grandfathers fought for the Confederacy. That being said I think the South was on the VERY WRONG side and had to be defeated. I have an ancestral line that was in Mississippi at the time of the Civil War. No direct-line Confederate soldier, but many collateral relatives fought for the South. There are also slaveholders in my ancestry. 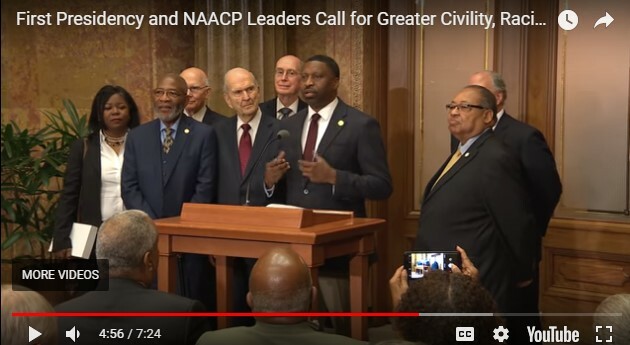 I think the important thing is where we come out on these issues today and how we treat each other as we continue to build our more perfect Union. I know this is over one year later, but I recently found this site. One line of my direct ancestors were Confederate soldiers and I think one was a Lieutenant. Many of the family were killed: brothers, cousins, etc. Albert Sydney Johnston is also an ancestor, on my fathers side, and he was sent by Pres. Buchannon to Utah to squelch the Mormons. My father converted to the LDS church as did my mother. My ancestors were poor and did not own slaves. 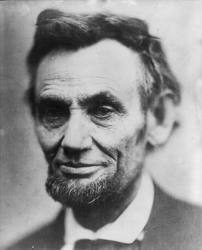 I sometimes wonder what they thought about the War Between the States and what their beliefs were. One direct ancestor became a celebrity in the South after the war. I am proud of my ancestors and can't help where I come from. They originally came from Armenia, the line that fought for the South, and my maiden name is the Armenian name. Did they fight because their new Southern government told them to even though they did not agree? Unfortunately they did not leave journals or records of any kind. I personally feel the South was wrong even though my parents are Southerners as are all cousins, aunts, uncles etc. and still live in the South. Yes, one has to be a Southerner to understand the mentality (just like cultural Mormons have their brand of mentality). I agree that it is important how we treat each other.